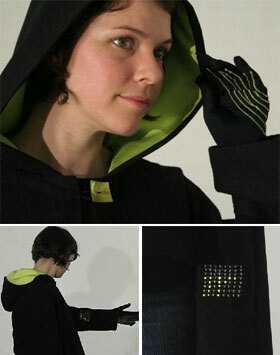 WAb (Wearable Absence) is an interactive garment connecting to a database wireless via a mobile device to enhance the wearers emotional stage with prerecorded memories in audio/visual from. The WAb garment is fitted with a range of senors that detect heart rate and skin conductivity which allow to calculate the stress or relaxed level, excitement or balanced physical stage. A database is loaded with audio (music) and visual (photos) content the owner of the WAb garment categorizes to recreate memories associated to different physical conditions. Bio sensors send continuously the physical condition of the wearer to the database which returns the associated audio/visual stimulus to the garments integrated speaker and display, recreating memories based on the current physical condition. We select clothing based not only on functional needs we choose clothing to a high degree out of emotional reasons. Adding additional emotional elements as demonstrated in the WAb design or other memory rich clothing concepts is a logical next step in fashion enabled through wearable technologies. Clothing that gives us stimulus based on or changing mood swings and not based on a pre-set time line or play-list has a magical, surprising factor. WAb is a collaboration project between Barbara Layne, Director of Studio subTela at Hexagram-Concordia in Montreal and Janis Jefferies, Artistic Director of the Digital Studios at Goldsmiths College in London.